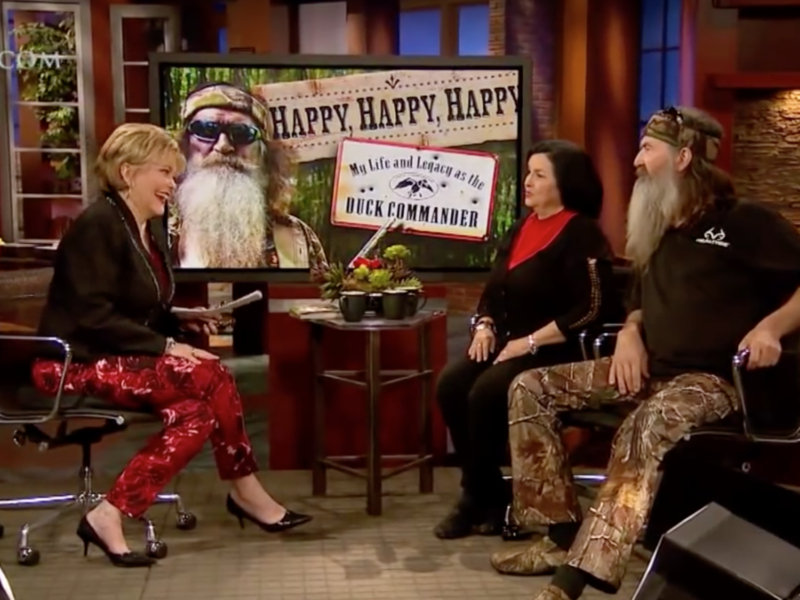 Though Phil and Kay Robertson are well-known for their beautiful family and loving marriage, the truth is that their relationship was not always a loving and Christ-centered one. In fact, the beginning of their marriage was so rough that at one point Phil kicked Kay and the children out of the house. The Robertson’s shared all of the rough details of those early years in a recent interview on The 700 Club. When Phil and Kay first married they were both in their 20s and naively believed that they would never have struggled in their marriage. Kay’s grandmother had planted the deep belief in Kay that there was only “one man and one wife for one life” which Kay translated into meaning that once married you lived in a fairytale sort of love story for the rest of your life. However, the newlyweds quickly discovered that marriage can be anything but easy. Phil was a bar owner and was often out late at night getting drunk, only to come home and not be the loving and caring husband that Kay needed. This led to lots of hurt and confusion for Kay, who didn’t understand what she had done to deserve being treated in this way. “The problem – in a nutshell, was that I didn’t know Jesus,” Phil shared in the interview. For years Phil ran from having any kind of relationship with the Lord until finally, he turned to a preacher, who he had once been rude to, for guidance in understanding who God was. However, even after having the entirety of the truth of the Gospel shared with him, Phil did not immediately decide to convert and work on his marriage with Kay. Instead, life remained largely unchanged for the Robertson family. Reflecting on this period in time, Kay remembers the night she realized was operating on her grandmother’s faith and not her own. It was during those moments in the bathroom that God showed up and reminded her that he was protecting her through all of this pain. The Robertson’s nine-year-old son Alan walked through the bathroom door and gave his first sermon to his mother. This was a huge moment for Kay that eventually led her to make the life-changing decision of giving her life fully to Christ after speaking with the same preacher that Phil had spoken to in the past. It was a huge step towards healing for Kay even though it did not mean that restoration with Phil happened immediately. This fact of their story is something that Kay wants everyone with marriage issues to understand. Instead, their marriage had to hit rock bottom before the restoration began. As Kay began to become heavily involved in church, Mr. Robertson became angrier and angrier and eventually kicked Kay and their children out of the house. Then, one day, Phil appeared in his truck outside of Kay’s work and with tears in his eyes begged to have his family back. On that day over forty years ago Mr. Robertson decided to give his life to the Lord and he has not looked back ever since. Praying that God would have his transformative and restorative power take place in your life today!